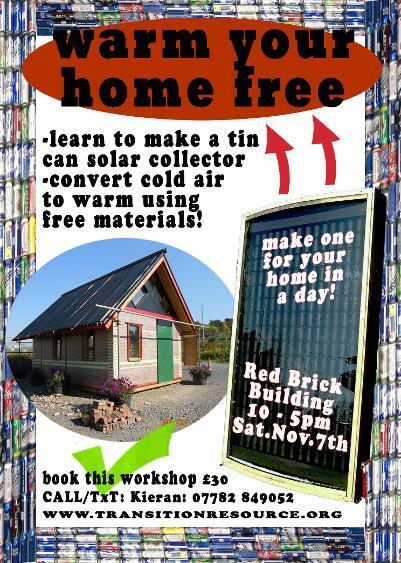 In this one day workshop you will learn to make your own tin can solar collector that you can take home and put in your window to help warm your home through the winter. You will learn about solar energy, convection and heat transfer and you will be given the skills to put the theory in to practice. We provide some consumables like gaffe, paint, glue, insulation and simple tools. However as it is our remit to turn rubbish in to resources you will need to collect some things for your own solar collector. You will need to bring items like a shallow cardboard box, a collection of tins and or cans that are all the same and stackable and finally a piece of glass or perspex that about fits the broad face of the box. If you cannot find all these materials we do of course have all of these things and can lend them but please be warned that we cannot guarantee that we can provide everybody with them so you must bring some of your own. The workshop will take place in the Argos Catalogue building at the Red Brick Centre on the Moorlands Enterprise Park between Glastonbury and Street. If you do not know where this is then just google red brick building centre glastonbury and it will come up first hit. The workshop will commence from 10 am on Sat the 7th November 2015. Tea/Coffee/snacks and food are available from the Bocabar on site. If you do not have money for lunch at the Bocabar then please bring a packed lunch. The workshop will continue until every one has made their tin can solar collectors and then after there is also a chance to learn from some experimental examples that are actually on the Argos Catalogue building itself! warm clothes because the solar collectors on the Catalogue building aren't built yet! It may be cod in the morning. some old clothes, some tactile gloves because we will be using some sharp objects. a lunch or lunch money. a note pad and a pen to take notes. a collection of the same tins or cans that stack. a shallow cardboard box (about 40cm deep). a piece of glass or perspex that will fit over the broad face of your box. a sense of humour, your self and possibly a warm drink! The course cost is £30 to cover our costs of materials and all monies will go back in to the cause of Transition Resource (read more below). If you have any further questions please contact Kieran.